At AoBBlog, we like graphs and data. Therefore, I decided to approach our ‘Record-Breaking Plants’ week slightly different, by trying to find out which plant generated the highest interest online this year. Google Trends visualises ‘interest’ in a topic or keyword within a specific time frame on a scale from 0-100. A value of 100 indicates the “peak popularity for the term”, and a value of 50 means that the term is half as popular. I started with the keyword “plant”, obviously. To my delight, this produced a rhythmic, repeating pattern, which correlated with the seasons. People appear to be more interested in plants in spring time than around Christmas. Graph showing the interest in the search term ‘plant’ over the last five years. Underneath this graph, Google lists related queries, and on second place appeared the ‘banana kiwi’ plant. The graph for this search term showed zero interest in it over the past year (indeed, five years). But then, a sudden peak in March! What had happened? Google Trends graph showing a sharp peak of interest in the ‘banana kiwi’ hybrid in April 2016. 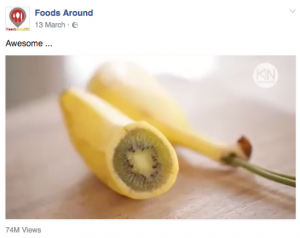 This Banana Kiwi hybrid video on the ‘Foods Around’ Facebook page has been viewed over 74 million times. It turns out that the banana kiwi hybrid plant (‘Baniwi’, in short) was a very successful April Fool’s prank by the Robert Mahar of Kin Community. He explained how the ‘baniwi’ hybrid could be grown: By pressing together one half of a kiwi and one half of a banana and planting them in soil. After three weeks, the plant supposedly had produced a hybrid fruit, protected by banana skin and with flesh of a kiwi. The Facebook page ‘Foods Around‘ edited this and posted a short extract from the longer video by Robert Mahar, and without the more obvious clues that this was an April Fool joke, this went viral. The baniwi hoax has been debunked here and here. 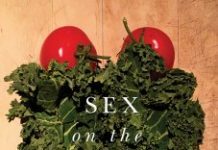 Bananas did however hit the news in 2016 in a much more serious context. The Cavendish cultivar, the banana that we buy in supermarkets, is propagated via cloning and grown as monoculture. This makes it extremely vulnerable to diseases such as Panama disease, caused by the fungus Fusarium oxysporumf.sp. cubense (Ordonez et al., 2016; Stergiopoulus et al., 2016). How can we save our banana from extinction? 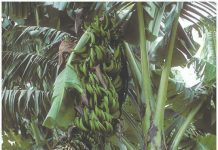 We could try to create somaclonal variations of the Cavendish through hybridisation; change the genome locations that make it susceptible to diseases via plant breeding or CRISPR-Cas9 genome editing approaches; or we could go on a hunt for new wild banana varieties (Heslop-Harrison and Schwarzacher, 2007; Stone, 2016). It looks like Puerto Rico could be a good starting place for this search (Charles, 2016). We will be keeping an eye on the banana and its future in 2017. In the meantime, why not follow the suggestion of the video below, created by the Banana Research Group at Wageningen University? Add ‘Become a banana friend’ to your New Year’s resolutions! 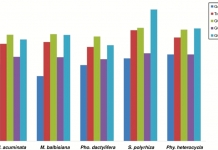 Next articleDoes removal of secondary metabolites improve Zingiberaceous nuclei quality?